Addiction is a family affair. It’s well-known that addicts have an abnormal addiction to a substance. What is less understood is that family members have an abnormal addiction to the addict. The dysfunction and trauma created impacts everyone involved. NCADD- Sacramento believes that families deserve education, treatment and support so they can heal from the trauma of living with active addiction. We know that untreated codependence can be just as debilitating as untreated addiction- with real damage done to the minds, bodies and spirits of all family members. How do we know? We receive daily calls on our Hopeline from families seeking relief. 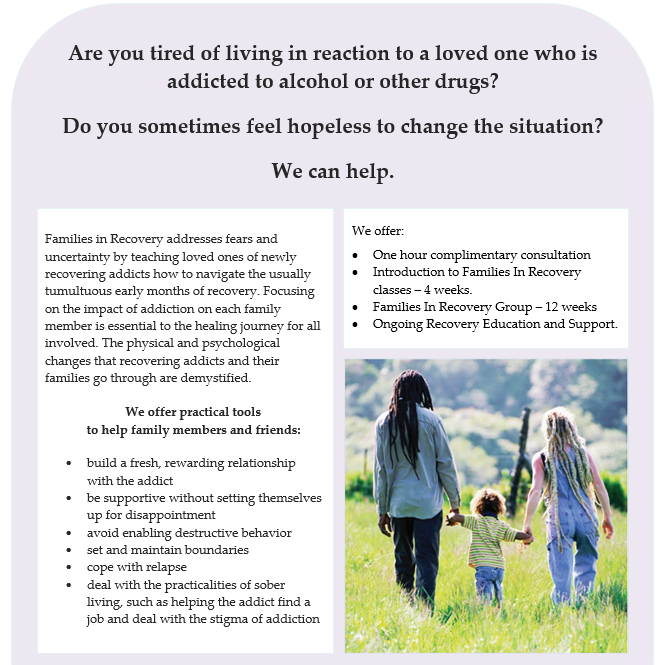 Talking with experienced counselors/therapists and sharing and learning with other families helped me to see that my husband and I are not alone–many families face the challenge of having an addicted loved one. I learned about the science of addiction, how to recognize I was enabling, and how to honestly face what I can and can’t do. I cannot make my son change but I can change how I am. Whether one considers the problem from a human, institutional or economic perspective, the impact is profound. We are pleased to fill this gap in our community. Families who are armed with accurate information about this disease can- and do- restore themselves to health and harmony.